Samoa has missed out on a third gold medal at the Commonwealth Games. 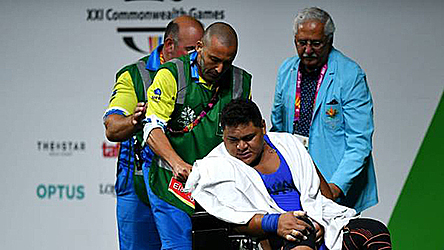 Samoa’s final lifter Lauititi Lui had to settle for a silver medal in men's 105kg-plus division. He was in contention for gold but collapsed on his final lift, before Kiwi David Liti overtook him with a lift of 229kg. Lui was assisted from the lifting platform in a wheelchair. Lui’s performance ended a golden day for Samoa at the Commonwealth Games. Sanele Mao and Feagaiga Stowers hoisted their way to gold medals. Samoa's three previous gold medals came at the Delhi Games in 2010 and all were won on the weightlifting stage.